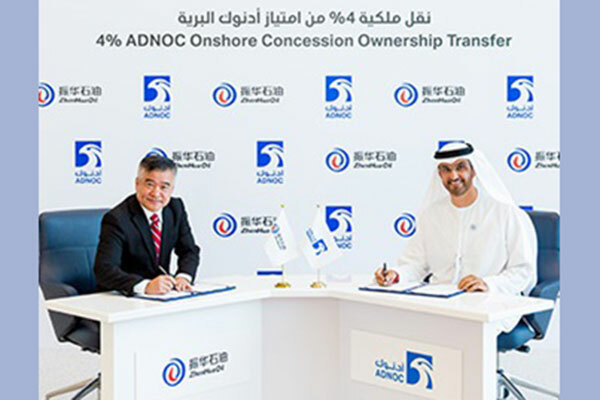 The Abu Dhabi National Oil Company (Adnoc) said that four per cent stake in its onshore concession, previously held by CEFC China Energy Company Limited (CEFC China), has been acquired by North Petroleum International Company Ltd, a subsidiary of China ZhenHua Oil. The ownership change has been approved by Abu Dhabi’s Supreme Petroleum Council and is in line with the UAE leadership’s directives to grant access to Abu Dhabi’s oil and gas concessions to partners who offer technology, operational experience, capital or market access. The transfer was endorsed by Dr Sultan Ahmed Al Jaber, UAE Minister of State and Adnoc Group CEO, and Liu Yijiang, chairman of China ZhenHua Oil. China ZhenHua Oil is 100 per cent indirectly owned by the Assets Supervision and Administration Commission of the State Council, a Chinese-government agency that supervises and manages over a hundred state-owned assets and enterprises in a variety of sectors, including telecommunications, oil and petrochemicals and transport. China ZhenHua Oil operates 11 oil and gas upstream projects in six countries, with gross production of close to 10 million metric tons per year. It is also in the fuel storage, transportation and refining business, with a trading desk in Singapore. China ZhenHua Oil joins BP of the UK (10 per cent), Total of France (10 per cent), China National Petroleum Corporation (CNPC) (8 per cent), Inpex Corporation of Japan (5 per cent), and GS Energy of South Korea (3 per cent) as participants in the onshore concession and shareholders of Adnoc Onshore. Adnoc retains a majority 60 per cent share in the Adnoc Onshore operated concession.